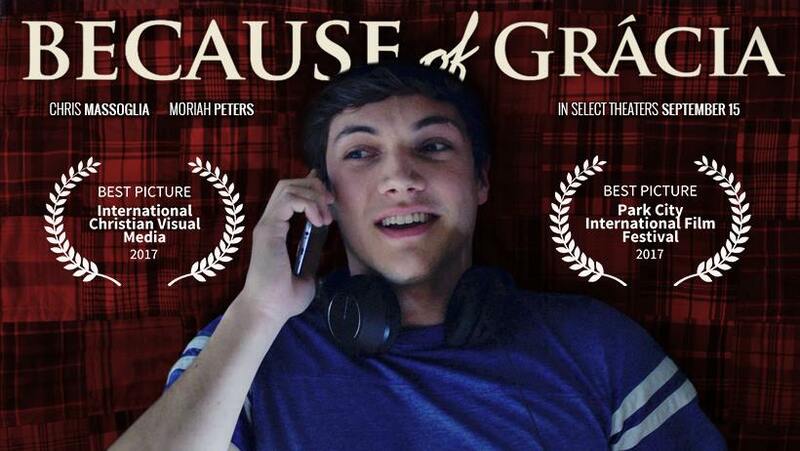 Chase Morgan would love to live up to his own name and pursue something great. It’s his senior year, and he’s still as insecure as ever, but Eastglenn High’s newest student is about to turn that around. Grácia is a girl with charisma, intelligence and conviction, but she’s not as put together as Chase and his best friend O.B. might think. A dark past gives her a unique connection with Bobbi, a misunderstood classmate who has a pushy boyfriend and disconnected father. This will be a ticketed event, it is FREE however the studio requires it to be ticketed. For tickets contact Faith and Family Films at 802-565-8013. This is the big 2018 ProLife Film! There is a new air of Christian Cooperation in Vermont and we want YOU to be a part of it! Interested? On October 29th, from 2-4:30pm, at Our Lady of the Angels Church in Randolph VT, we will be holding a gathering of all Christian Churches, Organizations, Ministries and fellow worshipers who are interested in Christian Cooperation. There will be round-table discussions on Christian Cooperation and brainstorming sessions on how best we can serve our Christian community. There will be short presentations from organizations and ministries serving our state. And there will be time for you all to make new friends and share in The Good News. Just imagine if there was a way to coordinate hundreds of Churches and tens of thousands of Christians in a matter of minutes. Imagine if there was an easy way to find all the Christian events happening in your area in just a few seconds. And imagine if you could share your own church news to the whole VT Christian community with just one click. These are just a few hopes the new Vermont Ecumenical Council has. Over the past two years the VEC has undertaken a reorganization and refocusing in hopes to better serve the Christian community in Vermont and better represent the diverse spectrum of Christian churches and organizations in our state. We are also enhancing communications with our website and making more effective use of social media to assist in the effort to build and maintain a robust network of Christian cooperation. Our hope is that with this new focus and direction we can assemble a network that helps build up the Church in Vermont by supporting our Christian brothers and sisters, our neighboring Christian Churches and all those Christian organizations that minister to us. All Christians are called to share the love of Christ in whatever capacity they are able. And the new VEC is doing just that. 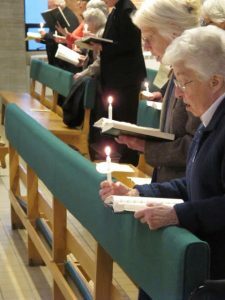 Among other benefits of membership, such as new colleagues, shared resources, prayer, learning and working together and the joy of living into our Lord’s desire “that they all might be one,” will be the opportunity to post events and other items of interest to our website and to get your information out to a much larger Christian audience than ever before. Just imagine the possibilities – one website, one network, over 100,000 Christians! Please join us – R.S.V.P by filling out this form. “At once, [the] Spirit pushed Jesus out into the wild. For forty wilderness days and nights he was tested by Satan. Wild animals were his companions, and angels took care of him.” – Mark 1:12-13, The Message, alt. 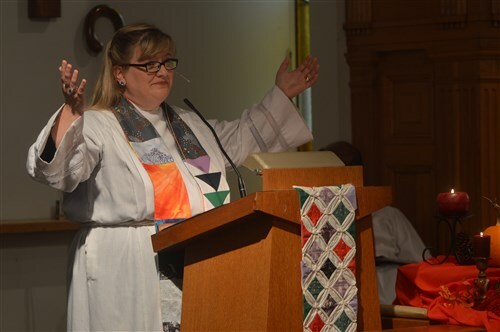 Vermont United Methodists welcomed the Rev. Jill Colley Robinson as their new superintendent with a service on Oct. 15, 2017 at Faith UMC in South Burlington. The bishop said that her “creativity and innovativeness, encouraging spirit, and sense of humor” are all qualities that the Vermont District Committee on Superintendency was seeking. As for himself, Bishop Devadhar said, he looks forward to the creative worship experiences Rev. Colley Robinson will bring to the Cabinet table. Rev. Perez said that her colleagues on the Cabinet will be there for her, and invoked the image of a seesaw. “There has been a lot of talk over the last few decades about the church, our church, being in the wilderness like those of the scriptures of old, like Jesus at the very beginning of his ministry,” Rev. Colley Robinson said, and she pointed to the suggested reading list for new District Superintendents that includes titles such as “Journey into the Wilderness” and “Next Steps in the Wilderness” by Gil Rendle. Being the scouts, even ones with strong faith, can be difficult, Rev. Colley Robinson said. “Like the Hebrew people, we hope and pray we are headed in a right and good direction to get to wherever God wants us to be, but feel lost much of the time and get downright grumpy about the whole thing,” she said. But Christian scouts have an advantage over the explorers and map makers of centuries ago who could only guess at what lay ahead, she said. Maze drawn by Isaiah Robinson, 8. Rev. 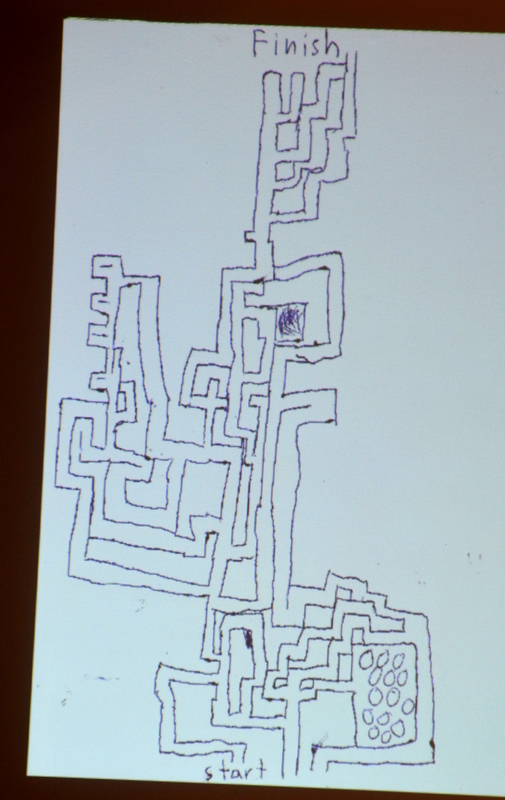 Colley Robinson showed a picture of a maze drawn by her son Isaiah, 8. She said he often draws mazes like this one for her to follow. (Click the image to see a larger version). “His is the type of maze where there are seemingly many paths from the start to the finish, but only one that will get you from one side to the other,” she said. And, Rev. Colley Robinson said, she often finds it easier to start at the end and work backward. Knowing the end point, the destination, makes all the difference. Hosted by the Catholic Church in Vermont, sponsors for the event include Catholic Relief Services, Oregon Catholic Press, Saint Michael’s College, Sisters of Mercy, Catholic Climate Covenant, United States Conference of Catholic Bishops Department of Peace, Justice and Human Development, Courtyard Burlington Harbor Hotel, Keurig Green Mountain Coffee, Green Mountain Habitat for Humanity, and Green Mountain Monastery. General registration is $35 per person and includes morning pastries, lunch and afternoon breakout sessions. Students can register for free. To register or learn more, visit: vermontcatholic.org/actionforecojustice. Dr. Carolyn Woo, who from 2012-2016 was president and CEO of CRS, the U.S. Catholic Church’s official, international humanitarian and development aid agency, will present a personal look at the encyclical she helped Pope Francis present in Rome, at environmental degradation and its effect on the poor and at measures to minimize further environmental harm from carbon emissions and remediate damage already done. With perspectives from scientists, politicians, activists, economists, professionals, academics and people of various faiths, the conference will offer the opportunity for dynamic conversations about the state of creation and how people can work together for a sustainable future. CRS staff “works face to face every day with the effects of climate warming,” Woo said. These include working with farmers whose livelihood is negatively impacted by erratic rainfall, which causes problems like drought on one extreme and soil erosion from deluges of rain on the other. Catholic Relief Services was founded in 1943 by the Catholic bishops of the United States to serve World War II survivors in Europe. Since then, it has expanded to reach more than 100 million people in over 100 countries on five continents. Its mission is to assist impoverished and disadvantaged people overseas, working in the spirit of Catholic social teaching to promote the sacredness of human life and the dignity of the human person. With that mission rooted in the Catholic faith, CRS operations serve people based solely on need, regardless of their race, religion or ethnicity. In the United States, CRS engages Catholics to live their faith in solidarity with the poor and suffering people of the world. For more information: outreach@vermontcatholic.org or Stephanie Clary at 802-846-5822. To learn more about the Year of Creation please visit: vermontcatholic.org/yearofcreation. 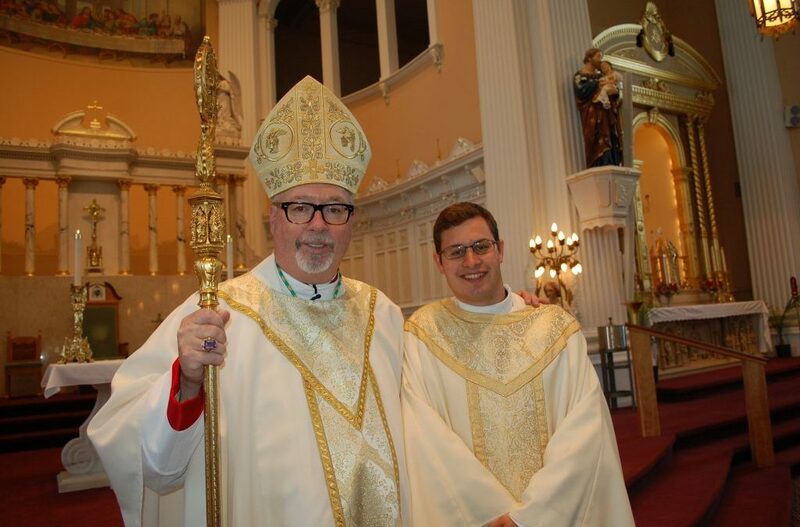 Burlington Bishop Christopher J. Coyne ordained the Vermont Catholic community’s newest priest at a special Mass June 17 at St. Joseph Co-Cathedral in Burlington. The newly ordained Father Joseph J. Sanderson has been assigned to serve as parochial vicar at Christ the King-St. Anthony Parish in Burlington. “The call to be a Christian is a call to a life of self-emptying sacrifice, which is deepened even further in the priestly ministry when through ordination one is configured even more deeply into the person of Christ as the great High Priest,” Bishop Coyne said during the ordination Mass. Born in Middlebury in 1990, Father Sanderson is the eldest of the three children of Jennifer and John Sanderson. He grew up in Orwell and attended Fair Haven Union High School, Our Lady of Providence Seminary, Providence College and St. John’s Seminary in Boston. The Rev. Kim Hardy of St. James Episcopal Church, Essex Junction, and her husband, the Rev. Dr. Fred Moser of Trinity Episcopal Church, Shelburne, invite you to join them for a Pilgrimage in Ireland from September 27 to October 5, 2017! Ireland is a place of exquisite natural beauty, a place of deep resonance regarding myth and Christian exploration to what was once known as the edge of the earth. These journeys seek to offer a time of renewal of mind, body and spirit through powerful connections with nature, rich exploration of Celtic spirituality, and learning with amazing guides and teachers. 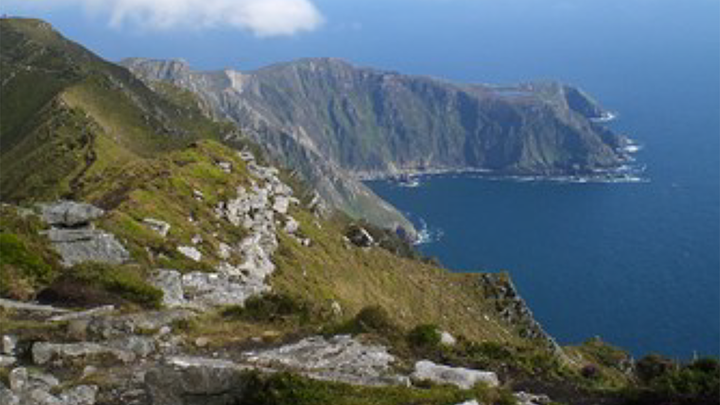 The destination will be parts of Northern Ireland and the Donegal areas, a guided journey through a northern arc of the island of Ireland connecting with sites of powerful spiritual significance and the rich natural, cultural and religious heritage of this divided island. The dates of this special journey coincide with the less crowded shoulder seasons, which are fabulous times to connect with the land in Ireland. Let your imagination soar regarding the learning and enrichment this journey offers, richness that will continue to inform our spiritual lives as we return refreshed with new viewpoints and deepened friendships. Registration is ongoing, but spaces are filling. Please register by May 15 at the latest! For information and to register contact the Rev. Hardy at kimhardy138@comcast.net . 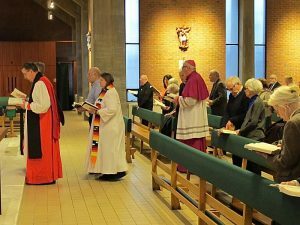 On Sunday January 22, the VEC celebrated the annual Vigil for Christian Unity hosted this year at St. Michael’s Chapel on the campus of St. Michael’s College in Colchester. 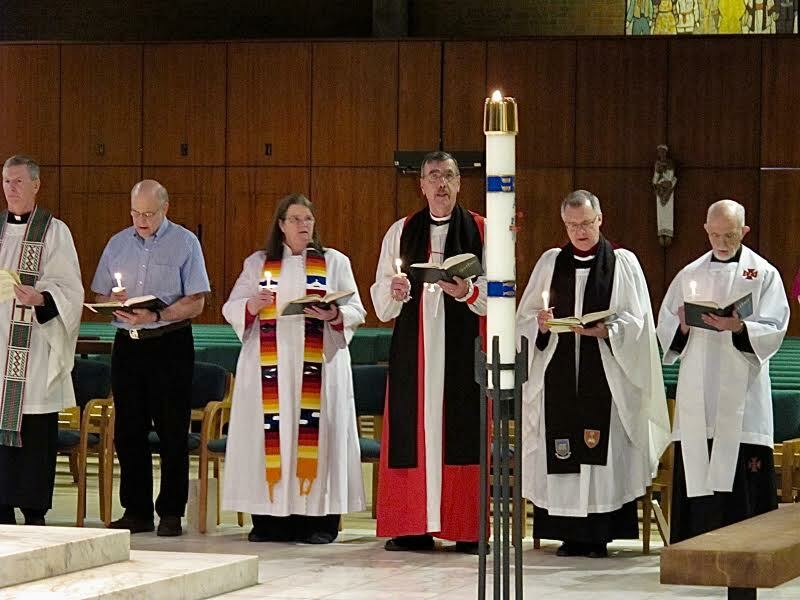 The theme of this year’s service was reconciliation. The prayer service drew upon the image of walls of separation and division that exist between Christian communities, created by the”stones” of realities like “hate, contempt, false accusation, and pride.” Father Richard Berube, SSE spoke eloquently of the need for unity within our common faith in Christ and encourage those present to work diligently for reconciliation. Following the service, refreshments and fellowship were hosted in the Edmundite residence. This is the second encyclical of Pope Francis. It is addressed to “every person living on this planet” for an inclusive dialogue about how people are shaping the future of the created world. He calls everyone to acknowledge the urgency of pursuing ecological justice and to join him in embarking on a new path based in integral ecology. Burlington Bishop Christopher Coyne invites all Catholics to join with him in celebrating this “Year of Creation” in the diocese. He noted the pope’s emphasis that concern for the created world is not optional, but an integral part of Church teaching on social justice. “While it has been nearly two years since its publication, I think it is time for the Church here in Vermont to study, ponder and begin to implement much of what the pope calls for” in the document, the bishop said. The diocese also has formed a partnership with Commons Energy that allows for low-cost energy efficiency audits and energy efficiency/renewable energy projects on many church-owned buildings throughout the state. Within the first two months of the year, fifteen buildings have requested to begin the energy efficiency audit process. Additionally, one of the first steps the Diocese of Burlington has taken at 55 Joy Drive in South Burlington, the diocesan headquarters, to counteract a “throwaway culture” and set an example of ecologically responsible practices is to adopt the practice of composting—a simple way to support circular models of production and consumption. “Vermont’s 118,000 Catholics can make a sustainable impact on the state of the created world and its creatures. 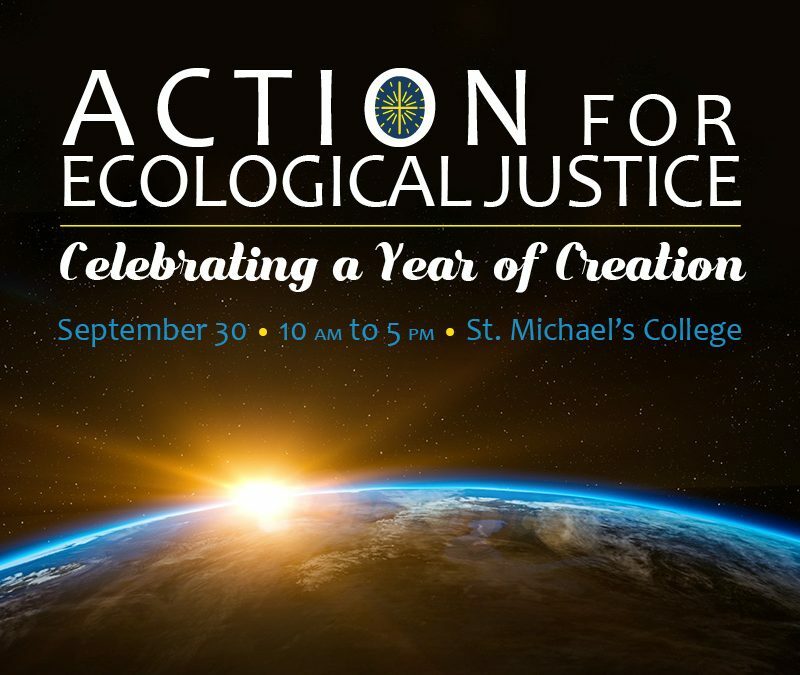 Furthermore, if the Diocese of Burlington’s Year of Creation is successful in raising awareness of and action toward ecological justice, it can serve as an encouraging example for other Catholic dioceses and communities of faith throughout the country and the globe. There are an estimated 1.2 billion Catholics on Earth—just think of what could be achieved if we committed to caring for the created world together,” said Stephanie Clary, mission outreach and communication coordinator. More than 350 people marched from Montpelier City Hall to the Statehouse Jan. 21 for the annual Rally for Life, meeting other pro-life advocates there to continue their call for respect for all human life. The event came the day after Donald J. Trump was inaugurated as 45th president of the United States, hours before the massive Women’s March on Montpelier drew an estimated 15,000 participants and the day before the 44th anniversary of the U.S. Supreme Court decision that legalized abortion. 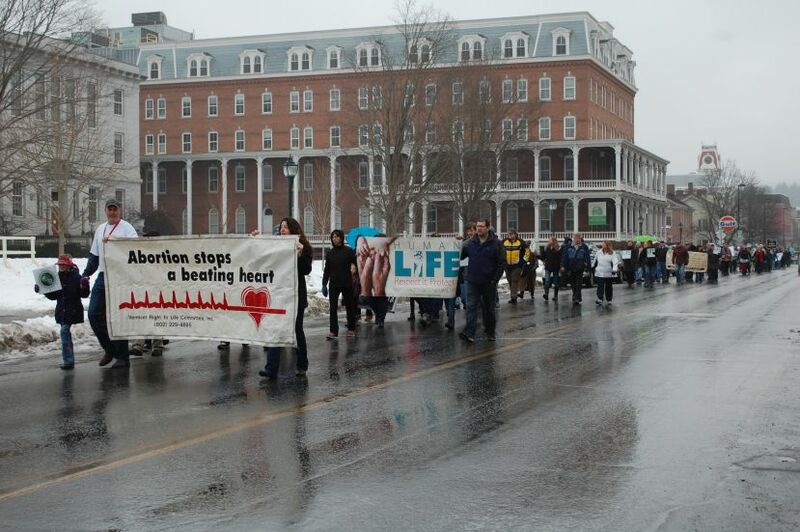 The day’s events began with a pro-life Mass at St. Augustine Church in Montpelier celebrated by Burlington Bishop Christopher J. Coyne; following the march, life advocates gathered in the House chambers to listen to speeches against abortion and in favor of measures to respect the life of all humans from conception until natural death. She told her Statehouse audience that she had an abortion at age 17, subsequently attempted suicide and spent more than five years working in an abortion clinic. But in 2010 she learned of a surrogate mother who was carrying a baby with Down syndrome, and the parents paid her contract and directed her to have an abortion. 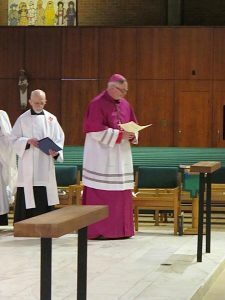 Bishop Coyne – who opened the Statehouse gathering with a prayer – gave the homily at the Mass and walked in the march. At the church he prayed for the protection of all human life especially those most vulnerable. Dr. Felix Callan of St. Andrew Church in Waterbury, who has been active in the pro-life movement since 1972, said he is more optimistic than in the past for an increase in respect for life. The election of Trump, who has said he is pro-life “could be an opportunity” for the pro-life cause to make strides nationally, he said. Regarding Trump, she said, “I have every reason to believe he will be true to his pro-life promises” which include appointing pro-life justices to the Supreme Court and defunding Planned Parenthood, a provider of abortions.